MEDIA RELEASE: Two of the best known names in New Zealand circuit racing – Inky Tulloch and John McIntyre – are backing themselves as contenders for the trophy for first New Zealand team, or even the outright winners for this year’s Highlands 101 endurance race. Tulloch and McIntyre, from Gore and Nelson respectively, line up among a full grid of 42 competitors for the 101-lap feature race at Highlands Motorsport Park’s Highlands 101 race meeting over the weekend of 13-15 November. 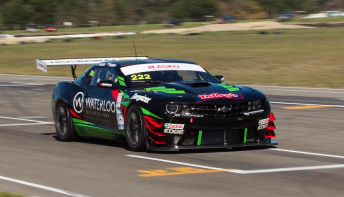 The pair pilots the German-built Chevrolet Camaro GT3 that Tulloch drove into fifth place in the 2014 Highlands 101 with V8 Supercar star Craig Lowndes, and secured the honour of first-placed Kiwi team. The car arrived from Reiter Engineering a month or so prior to the 101 and, at the time, was the only GT3 car of its type in the southern hemisphere. Tulloch says he thinks it may be difficult to repeat their first Kiwi home result. The former Mayor of Mataura and Gore District and a successful businessman, Tulloch has won numerous national and Australian motor racing titles in his four-plus decades of motorsport, including seven super truck championships. He teamed up with McIntyre, a multiple champion in New Zealand V8 classes, to win this year’s North Island Endurance Series in the Camaro. Consistent and fast, the pair took the series title with two race victories and a second place. “There’s no doubt the Camaro lends itself to endurance racing,” says McIntyre who rates the endurance race weekends with his and Tulloch’s long-time crews working together on the Camaro as being a lot of fun. Tulloch has also found an affinity with endurance racing in recent years. In addition to the events contested with Tulloch, McIntyre has had extra seat time in a Camaro GT3 car this year. He joined the M Motorsport Reiter Chevrolet Camaro for the penultimate round of the Australian GT Championship at Sandown. While the results weren’t quite as they’d hoped, McIntyre played a key role in helping the team improve the performance of their new-for-this-season Camaro. Having finished tenth the inaugural Highlands 101 race in 2013 with Simon Ellingham in a Porsche GT3 997, McIntyre says competing in this year’s 101 with Tulloch will be a highlight. Tulloch and McIntyre and Ferrari drivers Jono Lester and Graeme Smyth could be considered the two Kiwi teams with the greatest chance of an outright victory in the 101-lap feature race with its modern take on the famed Le Mans running start, but there are plenty of other Kiwi teams vying for the three trophies as the first three New Zealand teams home. Among the entries received to date are two teams – Simon Gilbertson and John DeVeth, and Ian Hayr and Glen Smith – both from Hawera and both in Porsche GT3 cars, Aucklanders Sam Filliore and Danny Stutterd who competed in the 2015 Bathurst 12 Hour race in their Porsche GT3 997, Dunedin’s Allan Dippie and Scott O’Donnell in another Porsche GT3, and Australia Gary Morgan with Taupo’s Mark Gibson in a Subaru BRZ. The 42-strong Highlands 101 field is expected to comprise largely of competitors from the Australian GT Championship who are contesting their two-race final round on the Saturday of the Highlands 101 race weekend. Tulloch and McIntyre’s Camaro is likely to, once again, be a fan favourite, but plenty will also enjoy seeing the exotic line-up of Lamborghinis, McLarens, Audis, Porsches, Mercedes Benz and Aston Martins in action on the 4.1 km Highland GT circuit. With more than 25 cars entered in the 1+01 one-hour race and nearly 20 in the Euromarque category, excellent racing is expected from the support categories. Motorcycle stunts and a special demonstration run from superbike racer Sloan Frost on his Suzuki GSXR1000 superbike add to the on-track entertainment. Spectators can also enjoy a special helicopter display featuring a former British Army Air Corps helicopter, a 1960s-built Westland Scout courtesy of the team from Warbirds over Wanaka, and flyboard demonstrations on the Highlands lake. The events schedule includes competitor practice sessions on Friday 13 November with public viewing available from the top terrace with a weekend pass or an entry ticket to the Highlands’ national motorsport museum. On Saturdayand Sunday, paying spectators can enjoy the free pit-lane walks, practice and racing from all classes, great viewing sites around the circuit, an array of local food and beverage providers and entertainment. To purchase tickets online, visit TicketDirect www.ticketdirect.co.nz and search for ‘Highlands 101 for discounted pre-event tickets, or visit the Highlands office to purchase directly.